Hypatia was a 5th-century Greek astronomer, mathematician and philosopher who was the head of the Platonist school of Alexandria where she taught students the philosophy of Plato, Plotinus and Aristotle. Beyond these facts not much is known of Hypatia's life and much of her legend can probably be attributed to exaggeration and hyperbole. That said, here is a summary of the somewhat apocryphal account of Hypatia of Alexandria. Hypatia is thought by some to have been the last Head Librarian of the Library of Alexandria which is estimated to have held over half a million documents from many nations including Assyria, Greece, Persia, Egypt and India (the number of documents has been disputed as has the date of the library's destruction). According to legend Hypatia's own death and the destruction of the Library of Alexandria were related. Hypatia was dragged through the streets, stripped, tortured, mutilated and finally burned by an angry Christian mob and the Library of Alexandria was burned down in the same furious campaign. Although the true fate of the Library of Alexandria is still in dispute, Hypatia's tragic and brutal end at the hands of the angry mob has been pretty well established. Alexandria was a pluralistic city in Hypatia's time with Jews, Christians and Pagans all living together. Hypatia was not targeted for any philosophical or ideological reasons, but rather she was the victim of bitter Alexandrian politics which tragically boiled over into a murderous rampage. In light of Hypatia's remarkable accomplishments and her untimely and horrific death there is not really much room for whimsy in any artistic representation of her. 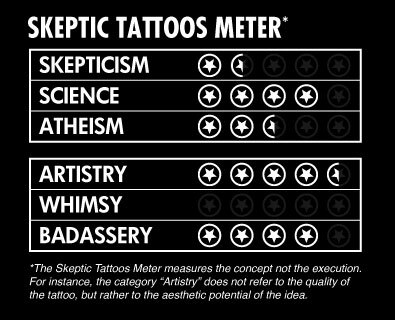 As a subject she does, however, get high marks on the Skeptic Tattoos Meter for artistry and badassery because she is an all too rare example of a prominent woman in the history of science. 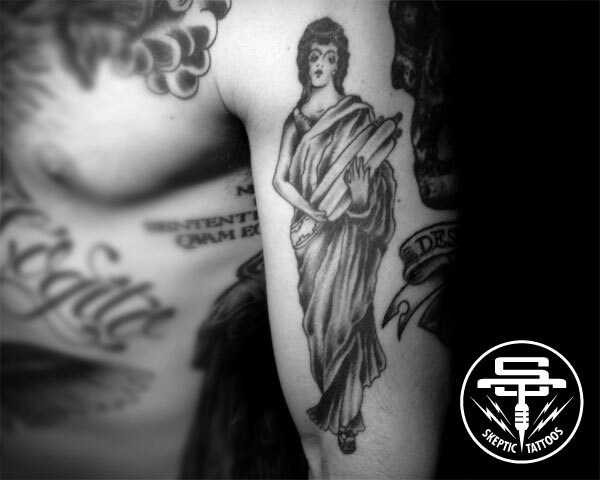 I chose to have her carrying three scrolls to represent the Library of Alexandria and I also chose to not overly sexualize her portrait lest I defame or misrepresent the legacy of a woman who accomplished so much intellectually and academically. Learn more about Hypatia of Alexandria.